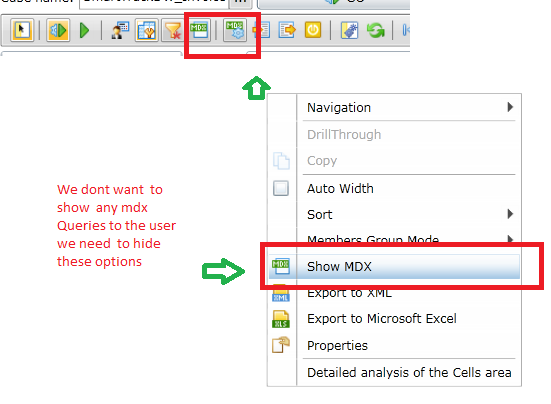 We don't want to show any options that related to Mdx Query .Can you please help us how to hide this options in tool . We will make improvements source code to synchronize access to the other buttons for to work with MDX Query. Though i added this line while initializing the Component am unable to hide the button.Can you please look at the screen shot which i attached and let me know whether i added in correct place or not . 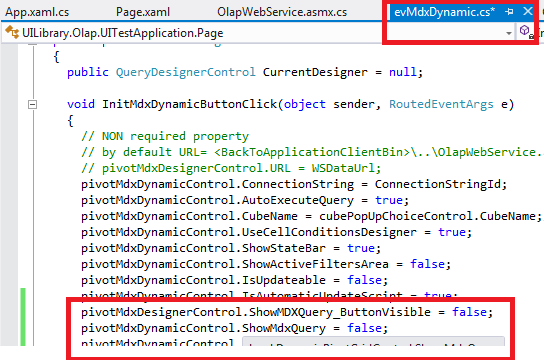 and am using pivotMdxDynamicControl component. For setting up a Toolbar in MdxDynamic recommend using an example Mdx Dynamic with Toolkit Chart (look Page.xaml -> swc:TabItem Header="Mdx Dynamic with Toolkit Chart"). You can hide the standard Toolbar Ranet and re-form their own. Issue is implemented in version Ranet.UILibrary.Olap.Silverlight 3.5. When it is necessary you can order a new build.